When Andy and I decided we wanted to honeymoon internationally at a tropical location, we emailed my blog friend Casey, who happens to be a travel agent. Y’all. This was the best decision we had and Andy agrees that having Casey in our corner was such a stress-reliever. After the stress of planning a wedding, I knew the last thing I wanted was the stress of planning our dream honeymoon so I let Casey handle all the planning. (We both agree when we travel internationally again, we’re letting Casey plan the trip.) Casey suggested a few different Caribbean islands for us and we picked Jamaica. 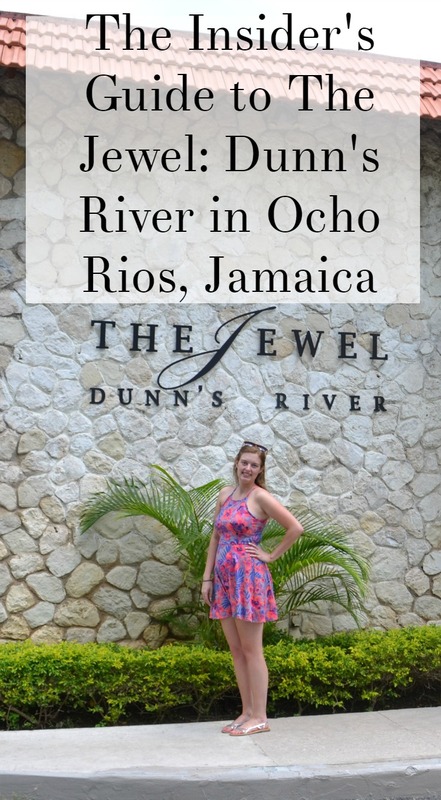 She suggested a few different resorts for us, and we settled on The Jewel: Dunn’s River in Ocho Rios. The Jewel: Dunn’s River is a Curio Collection by Hilton all-inclusive resort, which I loved because I’m familiar with the Hilton brand of hotels. The Jewel has a few different resorts in Jamaica (the others are Runaway Bay and Paradise Cove) but this was their only adults-only resort. We didn’t realize how much we loved being at an adults-only resort until we were there. We loved the all-inclusive aspect, because it meant no worrying about tipping or paying for meals (or drinks!) It’s a smaller resort, with about 250 rooms, which we loved because we didn’t have to deal with hordes of people or long walking distances from one side of the resort to the other. When we arrived, we were ushered into an open-air lobby and offered drinks. I still have no idea what I was drinking, but it was fruity and delicious and the perfect start to our honeymoon. Our room wasn’t quite ready yet, so we explored the resort a bit and ate at the pizza restaurant. Andy and I walked around the grounds, and we kept saying “Wow.” I mean, it truly was a dream come true! We were in paradise! When we arrived to our King Premier room, we were equally mesmerized. The bed was a beautiful king-sized four-poster bed. And so comfortable, too! Our room had a balcony, which we absolutely loved. I was out there every morning or evening enjoying the view and reading a book. The room had a lovely minibar with free drinks. However, we were disappointed that they only restocked our fridge once in our week there, despite multiple requests to the hotel front desk. Our disappointments in our room was the bathroom and the location. It was small, and for someone who loves taking baths, the tub was as tiny as the ones back home. (However, we didn’t book a room with a large tub, so that was our error.) Maybe on our next trip somewhere we will get a gigantic soaking tub! Although our room was at the end of a hallway, it was still busy with the stairwell located right next to our door. For some reason, the stairwell door was always propped open which contributed to the noise in the hallway. The Jewel: Dunn’s River has two pool, six restaurants (which I’ll blog about! ), five bars, a spa, and land and water sports. They offered motorized watersports at an additional price, but the non-motorized sports (kayaking, paddleboarding, and sailing) were included with your room rate. They also offered a free trip to the Runaway Bay Golf Course if golfing was your thing. If you wanted to go on excursions, you could book them through the hotel and have it charged to your room. The hotel advertises free wi-fi, but the wi-fi didn’t work in our room and we had to go to the lobby each time we needed to check something on the Internet. I actually didn’t mind this, because it kept me focused on enjoying time with my husband instead of mindlessly surfing the web. Also, I printed our boarding passes for our flight home from the business center, which was disappointing. The computers and printers were so old and slow that it took 25 minutes for something that should have taken 5. The beach was smaller, but not too crowded. We easily found beach chairs each day when we went there. The pools were also not terribly crowded. We frequented the smaller pool by the piano bar because there was less of a crowd. There were a few things we learned about the resort that they didn’t advertise on their website: the locals would walk through the ocean and along the beach in the early morning and late night hours. The resort security would watch them, but never asked them to stay off the property for some reason. Thankfully, my husband was always with me so I didn’t feel unsafe. Also, the locals would stand on the other side of the fence next to the free water sports cabin and yell at every tourist to come over. It was a bit unnerving. Andy and I watched a couple go to the fence and buy some ganja although we (obviously) didn’t go to the fence. The hotel also had many activities for the guests. From morning Aquasize to night-time parties in the courtyard, it felt like there was always something to do. We skipped out on most of the activities because we wanted to just sit by the ocean and the pool all day, but if you want to be entertained you won’t be disappointed. I’ll admit, it was a little frustrating when my husband and I wanted to go to bed at 9 pm and we couldn’t sleep because the loud music from the courtyard, but we quickly adjusted. Overall, we loved our time at The Jewel: Dunn’s River. We have very high standards for our next vacation because Jamaica was so amazing! Thanks again to Casey for such an amazing job planning this trip!